"Having Diabetes I have trouble with my feet. My G.P has not been able to offer too much in the way of treatment except to offer creams to prevent infection when the skin breaks down The skin is very dry and my legs are quite large resembling telephone poles especially below the knees. The skin is what I call Elephant skin. It is very hard, lumpy and at times very itchy. I have not been able to wear socks for years now and so the skin gets very damaged especially in cold weather. I have regular treatments from a Chiropodist as a part of my treatment for Diabetes, nail trimming etc. Since having my walkin bath my legs are not as hard or itchy. My feet are in the best condition in ten years according to the Chiropodist. I use the hydro massage for a brief time each time I bathe ,and I am sure that is a contributing fact in the improvement of my skin. I continue to use body lotion and baby oil as before but the bath is certainly been an enjoyable and easy way to improve the "feeling" in my legs and feet. P.S. The radio has been a treat. I enjoy listening while in the bath. It is a great addition as I am not one who likes to spend a long time in the tub. Also, the tub drains very quickly, more so than I ever dreamed it would. Feel free to adapt this any way you want to that will help. I am certainly pleased with the tub. Merry Christmas to you. " "Thank you, Thank you, Thank you for all of your kindness and compassion in getting us our tub to us within just a few days!" "My elderly mom's life has changed forever. Since the use of the hydrotherapy my mom has never felt so rejuvenated." "They did and excellent job on the installation and I would strongly recommend them to anyone as installers." "It's a "great invention" but the installers are the "BEST"." 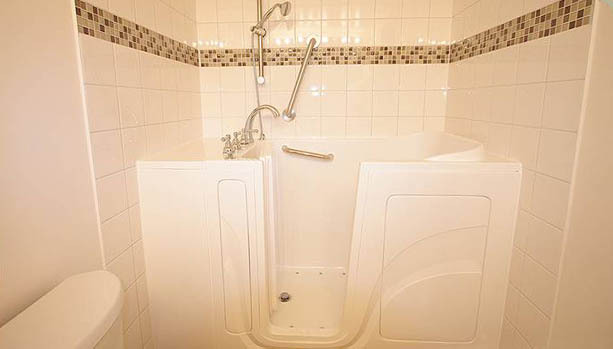 "I wanted to let you know that your walk in tub was totally beyond our expectation. The crème colored tub fits our bathroom perfectly." "Hi Rick ,Geraldine and I are doing quite well, the tub arrived at the right time as shortly there after Geraldine had a kidney infection and ended up in the Kingston Hospital for a week, her recovery has been slow but steady , and I/m sure that the worker that comes in here once a week to give her a good bath and shampoo has blessed that tub and the person who sold it to me every time she has been here. Geraldine also bathes on her own but the province provides this worker once a week and we always say that if Dalton wants to pay for it, thats what we give him taxes for. But we really are using and enjoying that tub, ( I even discovered its much easier for me to get in and out of).. and we have showed it off, and the workmanship you used to install it to one and all, and have told them of your personality an how easy you were to work with. We wish you much success in your business and will be glad to respond to any questions your customers might have."